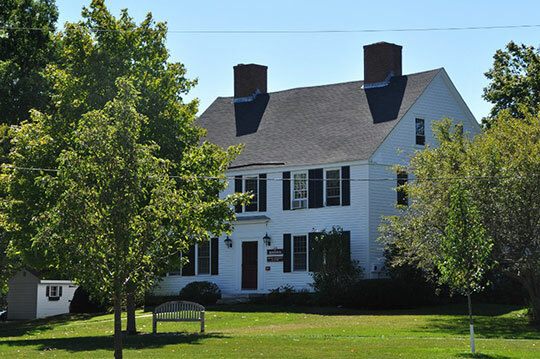 Newbury Town Hall is located at 12 Kent Way, Byfield, MA 01922; phone: 978-465-0862. Photo: Hale-Boynton House, ca. 1764, Middle Street, Newbury, MA. Listed on the National Register of Historic Places in 1983. Photographed by User:Magicpiano (own work), 2012, [cc-by-3.0 (creativecommons.org/licenses/by/3.0)], via Wikimedia Commons, accessed September, 2017. In 1633, Thomas Parker and James Noyes, both nonconformist ministers, with a like-minded group of British subjects, decided to emigrate to the Massachusetts Bay Colony, with the sanction of the Council of New England at Whitehall. At the same time, Richard and Stephen Dummer, Richard Saltonstall, and Henry Sewall and others in Wiltshire had organized a company to establish a stock-raising plantation in the Massachusetts Bay Colony because of the high prices in England for horses, cattle, sheep, and hogs. These men persuaded Parker and his group to join them. Most of these emigrants arrived at Ipswich (then Agawam) and spent the winter of 1634 there before moving farther east. The Massachusetts Bay Colony was then extending its inhabited frontier as far as possible as a bulwark against the "Papist French." In May of 1635, this small group of immigrants rowed shallops to the mouth of the Parker River (then Quascacunquen) and landed on the north shore east of the present Parker River bridge, at a spot now marked by a commemorative boulder. All was wilderness about them, and the settlers spent the first summer clearing land, building shelters, raising crops, and gathering the natural bounty of fish and berries for the winter. Each man was allotted land for a house, with a planting lot and salt meadow, the size depending on the amount of money the individual or family had invested in the venture. Mr. Dummer and his group had the largest acreage, more than a thousand acres, up river near the falls for their stock raising. Mr. Dummer was granted the right to erect a sawmill on the Newbury falls, and was given fifty acres of woodland to supply the mill. He was allowed to grind corn if he would grind "all the grain the residents might bring him." Later there were two mills in this area, one of which continued operation into the 1980s. As the population increased, settlers moved away from the banks of the Parker River, first to the Lower Green and then to the Upper Green. The church, a town government seat, a school, and a tavern were the necessities of the colony. Each man was assessed for the support of the meeting house. Newbury was first governed by a committee of all the freemen, with a clerk who kept careful records. Later "prudential men, no more than seven" executed the town business and reported to town meetings. As early as 1648, a meeting of freeman of Newbury voted to hold the meeting for choosing town officials the first Monday in March, and in 1681 it was voted that the general town meeting would be held the first Tuesday in March. Fines were imposed for absence from town meetings. Newbury originally extended from the Merrimack River to the Parker River, and from Plum Island to the town of Bradford. Plum Island, a nine-mile-long sandy barrier beach forming the eastern boundary of the town, was from the beginning a great natural asset to the town, an abundant source of salt hay and pasture for horses and cattle during the winter. In 1639, the town petitioned the General Court to be allowed sole use of Plum Island, but the Court divided the use of the island among Ipswich, Newbury, and Rowley. In 1739, the General Court enacted a conservation measure, forbidding the use of Plum Island as pasture, because grazing destroyed the grass roots, causing erosion. In the beginning the town was one parish called the First Parish of Newbury. In 1702, the residents of the Falls area built a meeting house because they were so far from the First Parish church. Thus began the parish of Byfield (for a short time called "Rowlbury"), extending for two miles in all directions from the Falls. This portion of Newbury was set off in 1706 as a separate parish for "so long as they maintain an Orthodox minister among them." It was, and still is, a part of the town of Newbury. The early settlers were largely engaged in agriculture and stock-raising. As the town grew and spread along the Merrimack River, the residents built wharves and docks where domestic and foreign trade flourished. These "waterside people" felt that they were wholly different from the husbandmen of Newbury, and petitioned the General Court to be set apart as a separate town. Newbury officials opposed the change, but after extensive litigation and financial adjustment the town of Newburyport was incorporated in 1764. The residents of the western portion of Newbury also built a meeting house in order to be closer to their house of worship, and consequently asked to be excused from taxes to support the First Parish meeting house. Thus the West Parish was born, and in 1819 this Parish was incorporated as a separate town of West Newbury (first called "Parsons," and changed to West Newbury in 1820). Although Newbury is smaller than in the first settlement days, it has inherited and incorporated many of the founders' principles: the importance of the town meeting form of government, the strength of the churches, the quality of education, and the obligation of the town to care for the well-being of all its residents. Town of Newbury, Master Plan, 2006, www.townofnewbury.org, accessed September, 2017.